The guys have kept us guessing over the past few days, as they’ve switched up the standard red-carpet formula for a range of looks that ventured far beyond the standard black suit. Chris Pratt: Joining Anna Faris and the other ladies at the ‘Jurassic World’ Los Angeles premiere held at the Dolby Theatre on Tuesday (June 9), the actor was ever so handsome in a dark slate-blue suit that nearly looked like brushed denim. I love that he heightened the impact of the suit with a graphic, chequered brown-and-white dress shirt and pocket square, completing the ensemble with a Chopard timepiece. Terrence Howard: The ‘Empire’ actor was feeling blue in a three-piece suit, paired with black Louis Leeman loafers, at Spike TV’s Guy’s Choice Awards last Friday (June 6) at Sony Pictures Studios in California. The look would have resonated more strongly with the pop of a patterned tie as opposed to his satiny blue variety. 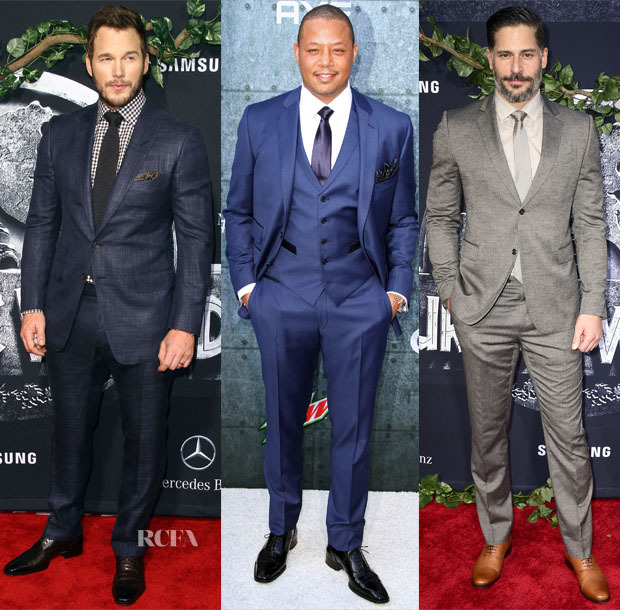 Joe Manganiello: Also at the ‘Jurassic World’ premiere, Joe had at least three shades of grey to his name in a heather-gray suit, dove-gray shirt, and tie. Tan Christian Louboutin ‘Trepeter’ flats broke up the more monochromatic tones. I’m not sure that it’s always advisable to match a suit to a salt-and-pepper beard, though. Adrian Grenier: In theory, I do like the idea of a bright blue suit on Adrian. In practice, his version worn at the ‘Entourage’ London premiere on Tuesday (June 9) didn’t come off as well as I would have hoped. Combined with a long blue tie and black dress shirt, this ensemble was slightly reminiscent of a retro-prom moment. Peter Gadiot: While the actor’s Zegna midnight-navy suit at the Guys’ Choice Awards reminded me of the fall season, there was something intriguingly spirited about the look—perhaps due in large part to the quirky Valas tuxedo shoes worn without socks. Jeremy Piven: Joining Adrian at the ‘Entourage’ premiere, Jeremy wore an all-black three-piece suit with a black button-down shirt. While it was a rather dark statement for summer, he still managed to give off his cool-boy charm by skipping a tie and wearing his signature frames.